The secret to reaching the next level is discomfort. Discomfort is where improvement begins. You must allow others to work through discomfort if you expect them to reach the next level. Comfort stabilizes performance, but also hinders improvement. Leadership is about relationships and environments that provoke others to reach for the next level. Moderate discomfort is central to the process. Reaching for the next level includes discomfort. “How can I help?” is a great leadership question. But if you’re interested in taking teams to the next level, helping less may be helpful. Performance over time doesn’t improve. People run to you for help before making their best efforts without you. You’re the first person people come to, rather than colleagues or team members. People expect you to cover for them. Bailouts are a daily practice. Low accountability continues or worsens. You make excuses for the poor performance of others. Too much help is hindrance. #1. Believe people will rise to challenges. #2. Trust that working through moderate difficulty elevates fulfillment. Work that isn’t challenging isn’t fun or fulfilling. #3. Delay helping. Don’t rush to rescue. Ask questions. Too much help encourages helplessness. Helping less isn’t detachment. It’s respect. Participate in conversations about purpose, improvement, process, goals, and achievements. #5. Challenge directly while providing encouragement. People respect you when you believe in their abilities. #7. Offer support, like a spotter with a a weightlifter. Too much discomfort is destructive. Think of adding too much weight to the bar. What role does discomfort play in reaching for the next level? 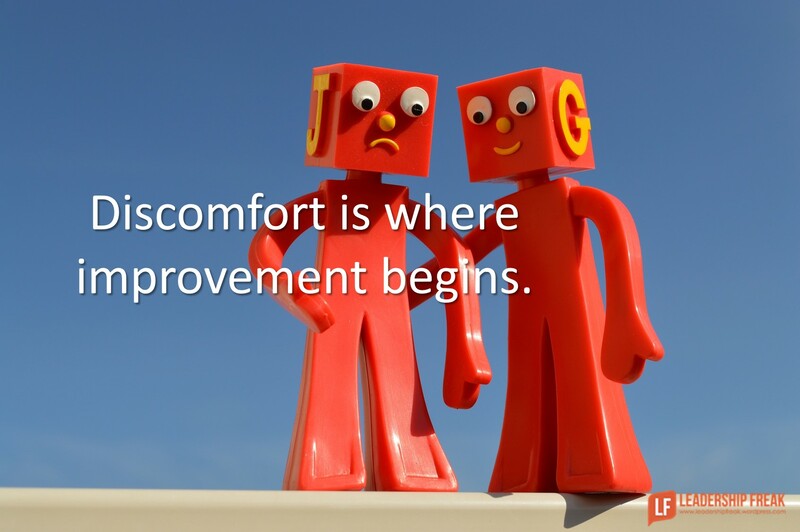 How might leaders allow for discomfort in the improvement process? Allowing others on the team to feel discomfort is HUGE like you said. I am currently going through that right now with one of my leaders. He had a very busy week last week and really felt the weight of the job. It was great for him because he got wins under his belt as well as learning experiences. I think of it like the gym. If you have a spotter constantly helping you move the weight, you don’t get all the reps and therefore don’t get the full benefit. Allowing your muscles to feel all the reps they can on their own is major because that is how they get broken down and come back stronger next time! A spotter’s job is to only be there when 100% necessary. I feel it is the same in any realm. Our job is to develop; and often times that requires us to step back. Thank you for writing helpful and thought-provoking posts. This one I learned as a stay-at-home mom 20 years ago.You can’t do everything for your toddler or they will never learn…or you’ll hear “I can do it myself” a lot. It’s one of many lessons I’ve successfully brought into the paid workforce. Is “the secret to reaching the next level is discomfort” another way of saying “the beatings will continue until morale improves!” ? Definitely something I will be taking with me to work tomorrow!